At 4 am on August 24, 2016 Turkey launched a military incursion into Syria. The invasion was named Operation Euphrates Shield. Speculation about the operation had started already in February 2016. On March 29, 2017, the Turkish National Security Council declared that the operation was "successfully completed". The operation, clearing the way for a force of about 500 Syrian rebels to take the border town, represented a significant escalation of Turkey’s role in the fight against the Islamic State, also known as ISIS and ISIL. But it also seemed as much about containing the territorial ambitions of Syrian Kurdish militias, which Turkey sees as its primary enemy in the conflict and which were poised to move against Jarabulus. Mr. Biden addressed those concerns at a news conference after his meeting with Mr. Erdogan, saying the Syrian Kurds, an American ally in the fight against the Islamic State militants, would have to withdraw to the eastern side of the Euphrates River. The Turkish military launched the Jarablus operation against “terror organizations such as Daesh and the PYD,” President Recep Tayyip Erdoğan has said, warning that threats from the latter will be responded to in kind. Photo: Soldiers of the Turkish Land Forces engaged in intense firefights when entering Syria to dislodge the Islamic State from the border city of Jarablus. According to Anadolu Agency one FSA member died in the taking of Jarablus. No casualties in the Turkish Army. A critical look on video snippets of the liberation of Jarablus as broadcasted by Anadolu Agency. In response to this statement, in which Erdogan and Yildrim showing their intention against Syrian people, some of the factions withdrew from this operation, while just some groups such as : Sultan Murad, Al Feteh army, Al Nusra Front(changed its name to Fateh Al Sham front now), Ahrar Al Sham and Nour Al-dien Zenki are taking part in the operation according to YPG. Turkey sent more tanks into northern Syria ...and demanded that the YPG retreat to the east side of the Euphrates within a week. The Kurdish militia had moved west of the river earlier this month as part of a US-backed operation, now completed, to capture the city of Manbij from ISIL. (YPG) is one of the most powerful rebel groups in Syria and regarded as the backbone of the Syrian Democratic Forces (SDF), a US-backed alliance formed last October to fight ISIL. Turkish Defence Minister Fikri Isik said preventing the Kurdish PYD party - the political arm of the YPG - from uniting Kurdish cantons east of Jarablus with those further west was a priority. 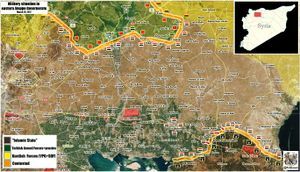 Kurdish YPG forces aligned with the United States in the fight against Daesh (ISIS) are now being mowed down by Turkey as American forces are left to look on and watch. "With the mediation of the US-led international coalition, we declared a ceasefire with Turkish military to stop the ongoing bloodshed and ensure the security of civilians. This ceasefire is recognized between our forces near Sajur River and occupant Turkish army. The parties that became a part of the efforts for ceasefire wish the permanency of the truce. We declare hereby that the ceasefire doesn't mean we accept the Turkish incursion into Jarablus." Up to 36 people were killed, dozens others injured as a suicide blast rocked a Syrian border-town with Turkey. Social media activists confirmed that most of the killed in Atmeh crossing border are militants fighting under the anti-ISIS, Turkish-backed Operation Euphrates Shield, including Ahrar al-Sham military commander Hisham Khalifah, and head of Supreme Judiciary Authority in Aleppo, Khalid al-Sayyed. August 29, "dozens of villages" north of Sajur river targeted by artillery, incl. Dandania where five civilians including three children die. The village was allegedly attacked with chemical weapons on August 25. Panicked in the face of the SDF forces' advance to the north after the Manbij victory, Turkish state took over Jarablus from ISIS in an arranged act, and handed it over to the FSA gangs affiliated to itself. The ISIS that resisted SDF forces for 75 days in Manbij, handed Jarablus over to FSA gangs guided by Turkish special forces in two hours. In other words, Turkish state did its mission of handover between gangs affiliated to itself without any clashes taking place. Even this single incident itself reveals the organic tie between Turkey and ISIS. 13.9.2016 Syrian Army threatens to retaliate against any unauthorized Turkish aircraft, Almasdar News. Ankara is carrying out a full-scale ground operation in Syria. This format has not been coordinated with Moscow and threatens to undermine the warming of Russian-Turkish relations. The Turkish incursion into Syria does not wreck the recent Russian - Turkish rapprochement because it is only a limited rapprochement not a realignment. In the meantime Russia is working hard to reconcile the Syrian government with the Kurds. This page was last edited on 29 March 2017, at 19:23.